In a US classroom decorated with paintings of Chinese folk tales 民间故事（mín jiān gù shì） and characters, a dozen children are performing popular songs 流行歌曲（liú xíng gē qū）in Mandarin, such as Daddy, Where Are We Going 爸爸去哪儿 and Stars in the Sky. Seven-year-old Anna has studied Chinese for two years.From Monday to Friday every week, Anna spends two hours learning Chinese at the school, writing characters 写汉字（xiě hàn zì）, playing games 做游戏（zuò yóu xì） and reciting the Three Character Primer, or San Zi Jing 三字经（sān zì jīng）, one of the ancient Chinese classic texts. During class, Anna and the other children were eager to introduce themselves and teach visitors how to say “hello 你好（nǐ hǎo）”, “thank you谢谢（xiè xiè）” and “goodbye再见（zài jiàn）” in Chinese. In March, the children shared their trips to Chinese cities such as Beijing 北京, Xi’an 西安 and Shanghai上海 with US First Lady Michelle Obama. 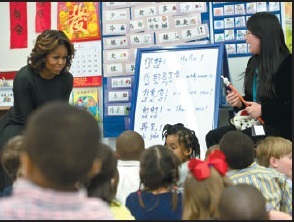 The first lady 第一夫人（dì yī fū rén ） told the children that it is extremely important for American students to immerse themselves in foreign languages and cultures at a school like Yuying, if they truly desire to learn more about other countries.